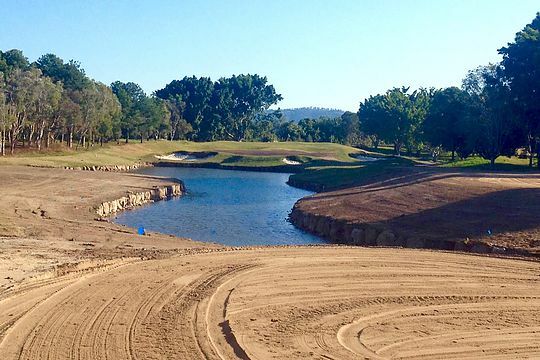 Australia’s richest tournament of the 2015 season, the Australian PGA Championship, is less than four months away and the second half of the course renovation of the RACV Royal Pines layout is bang on schedule. In fact, preparations are progressing at almost the identical rate as the work completed on the first nine holes in 2014, according to Graham Marsh Golf Design who are undertaking the project. PGA of Australia Chief Executive Brian Thorburn was excited by the progress made to date when he commented on Championship preparations last month. A walk around the course in early August revealed most of the new holes have been fully turfed, awaiting the crucial spring/summer growing season that Marsh’s team will be hoping mirrors the conditions experienced last year. Thorburn’s assessment of the par-three 16th is spot on, with a shallower, well bunkered green brought closer to the lake sure to test club selection as players look to complete their rounds with a flourish. The sturdy par-four 13th has been stiffened further with the creation of a new back tee well to the right of the existing teeing grounds. From the new tee, players will now have to cut off the corner of the lake on the right to reach the fairway, which has had more punitive bunkers installed in the landing area and around the green. The par-four 18th, which Adam Scott, Wade Ormsby and eventual champion Greg Chalmers became so closely acquainted with in last year’s marathon seven-hole playoff, will be almost unrecognisable even to them. The new fairway bunkering will certainly restrict a player’s ability to reach the green with ease as had been the case previously, and the green itself has been completely reshaped with a large drop off area at the front and right. The course changes will embellish what will be an exciting Championship from 3–6 December, with an increased prize fund of $1.75 million and for the first time, co-sanction status with the European Tour which will guarantee 60 of their members will be competing on the Gold Coast. “This will be the highest purse in Australian PGA Championship history and will position the tournament more strongly on the international stage with exposure to a greater broadcast platform than any of our previous tournaments.” Thorbun said.